This was my lunch or dinner a couple of months ago on a regular basis. It was divine. Luckily, I remembered to take at least this picture before I ate the whole thing on that particular day. It’s already about half gone. I love to eat things in bowls. The wonderful woman who has been coming to my house on Wednesdays for over a decade to help me with cleaning and errands likes to tease me that I “build” my lunch. It’s an accurate observation that always makes me laugh. Here’s what I did to “build” my bowl full of these goodies: I sauteed a few mushrooms in water, a splash of coconut aminos, and some sprinkles of garlic granules. Then I added a big fistful of greens to the saute. In this case it happened to be broccoli leaves and kale from my garden, and a torn up chard leaf. 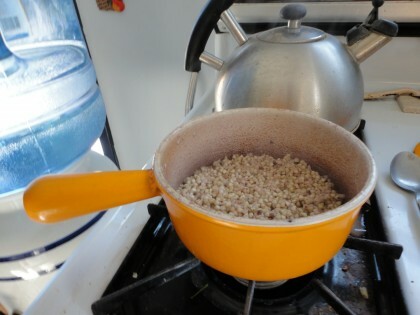 Once the greens were wilted, I added some cooked buckwheat groats and tossed them around to warm up, adding splashes of water as needed to prevent sticking. Then I dumped it into my bowl, and sprinkled it with a little ground flax and nutrituional yeast. Then I topped that with some chopped red cabbage, raw. Then I sprinkled on some balsamic vinegar I had infused with pear slices and dried cloves. Then I topped that with a leftover spoonful of lentil salad (cooked brown lentils, chopped celery, shallot or onion, raw zucchini, fresh dill and fennel, red bell pepper and a dressing of dijon mustard, raspberry red wine vinegar, lemon juice and garlic). Then I mixed it all up and ate it. Buckwheat groats are a cinch to cook. And completely gluten free, if you need that, like I do. They only take about ten minutes on the stovetop. The ratio of water to groats is two to one. Here’s what I do. Heat a heavy sauce pan on medium heat for about 30 seconds. Lightly toast the buckwheat groats, just until you can smell them. Add the water. When it comes to a boil, turn down to simmer, cover, and set the timer for 10 minutes. Turn off the heat after that, but leave the lid on and let them sit and steam and cool down a few minutes. Serve. I have a gas stove, so this may vary if you have a different kind of stove, but probably not much. I also add a shake or two of cinnamon, nutmeg, and cardomom, and, a splash of vanilla extract if I’m feeling fancy. Equal parts grains and a mixture of almond milk and water. Just let it sit for a few minutes in the fridge while you check e-mail. Then top with a teaspoon of golden flax meal. The buckwheat groats give a nutty crunch to the “bowl” without the gluten and processing in a product like Grape Nuts cereal. Buckwheat groats also make really good pancakes or pancake toppings. Here’s two recipes I have used. This one comes from the Food and Recipes section on the McDougall forum. It is the buckwheat groat version of Simplest Oatmeal Pancakes. Blend all ingredients in the blender. Let stand to thicken as you heat up a non-stick pan or griddle. Pour by 1/3 cup onto griddle. Sprinkle the top of the pancake with buckwheat groats before turning, if you’d like a crunchy effect, like putting sunflowers seeds or nuts on pancakes. And here’s one adapted from this recipe at Post Punk Kitchen. It’s my oil free version, with a few other tweaks, too. In a large mixing bowl, mix together all flours, ground flax seeds, tapioca, baking powder, cinnamon and salt. Create a well in the center and add the remaining ingredients. Use a fork to mix well for about a minute. Let the batter rest while you heat a non-stick skillet on medium heat. When beads of water dance on it’s cooking surface, it’s hot enough. Use an ice cream scooper to pour batter and form pancakes. (Issa does two at a time. Sometimes I do two at a time, sometimes only one). The pancake should start to form little air bubbles. Cook for 2 1/2 to 3 minutes, then flip and cook for 2 minutes more. Keep warm until ready to serve. And remember those Persimmon Bars at Straight Up Food? If you don’t want to use a whole half cup of walnuts in the recipe, sub some or all of them out with kasha. It works fine. Some people like to buy already toasted buckwheat groats instead of raw. In fact, I’ve heard the toasted ones are easier to find in stores. But I prefer the raw ones (I buy them in bulk at my co-op.) That way I can toast them or not. And I like the texture of cooked raw kasha better. Also easier for my “fibro” tummy to digest. But if you are a fan of toasted, here is a good recipe from Susan for Spicy Kasha Vegetable Salad. It’s where I first learned to use them. It’s a good basic recipe you can change up as you like. My newest expression of kasha love is to eat them topped with this easy and incredibly flavorful eggplant stew from my friend Fulenn’s blog Vegan Day to Day. (She also manages her MS beautifully by eating this way.) With a steamed veggie medley on the side, this dinner is what I would call Fall Ambrosia. Kasha’s earthy flavor and toothsome texture goes great with any sauce or veggie you would eat with pasta, such as greens, tomatoes, mushrooms or eggplant. 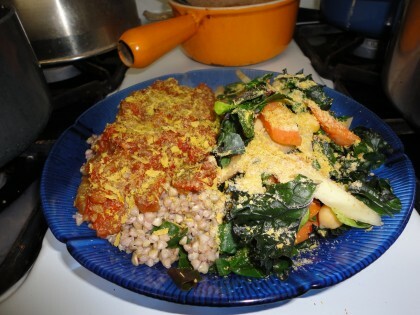 A tradtional Russian Jewish dish even pairs buckwheat groats wtth the pasta itself. Buckwheat groats are definitely peasant food. But I come from a long line of peasants. The highlight of my Summer reading this year was a wonderful recent translation of Dr. Zhivago. When Zhivago meets up again with Lara in Yuriatin, and they begin their doomed but beautiful love affair, the first time they speak she invites him in for a while, saying, “The kasha’s in the oven.” So Pasternak thought it was good enough for Yuri and Lara, who turned out to be two of literature’s greatest lovers, though they were punished for NOT being peasants. And in their idyllic time at Varikyno, Yuri Zhivago and his beloved aristocratic wife Tonya grew and ate potatoes. So there ya go. If we could all love like all of them did each other in the worst and most heartbreaking of times, maybe we’d be better off. Does simple food help that along? Could it be the magnesium in the kasha? The potassium in the potatoes? Maybe. Maybe. I’m more than willing to consider such possible magic. I came for the food, but am loving all of the Dr. Zhivago talk! p.s. I come from a long line of kasha eaters, it’s the Jewish peasant in me. So glad you joined us! I enjoyed making your black bean chili last Winter. 🙂 And here’s to coming from Jewish peasant background (my peasant ancestors are Italian and French Canadian), all farmers and/or gardeners. It’s wonderful you are loving the Dr. Zhivago talk, too–Thanks so much! I had to chuckle because I sat down in front of my laptop to read this with my dinner. In a bowl. Because I, too, love to eat out of bowls. Now I need to see if I can find Dr. Zhivago on Neftflix because the last time I saw it I was a kid. Time to watch it again! I am chuckling, too, as I reply. Another one who loves to eat out of bowls!! Thanks for telling me! Enjoy watching Dr. Zhivago again. It’s a great flick! Oh, I’m making groats for food tomorrow. I bought some a little while ago and forgot em…found them in my move…and that stir fry is JUST the ticket. I can just taste it now! Glad I inspired you! Cheers to your alternate starch Advent! I love all the ones you mentioned, though I can’t have barley. Hope you enjoy the stir fry. I’m intrigued. I’ve been plant-based for years, but I haven’t tried buckwheat groats before – I’ll try them this weekend! Hope you enjoy your maiden voyage with buckwheat groats. Let me know how it goes. Hmm, you’re so lucky to have bosc pears growing the garden! So grainy and sweet and delicious.Well, I must be on the right rack, because I eat very similarly to you. I haven’t really loved buckwheat so far. Never thought of eating it raw. Are you sure? Raw? Isn’t that a bit like eating uncooked rice? Perhaps I’m misunderstanding something, cos I’m not sure what “groats” are. I just have a package of buckwheat in my kitchen. Is that buckwheat groats? 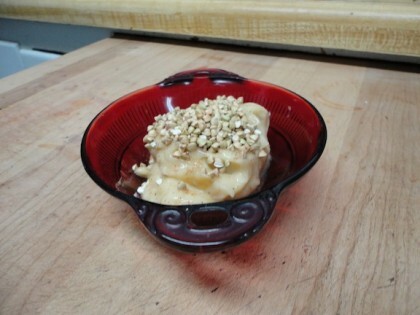 Would you mind sharing how you make your homemade pear sorbet? It looks delicious. My breakfast, which I’ve eaten unchanged for … perhaps 20 years, is a homemade meusli using whole oats and various other ingredients, soaked in water. I realised I didn’t need milk in it long before I started avoiding cheese, yoghurts, etc. 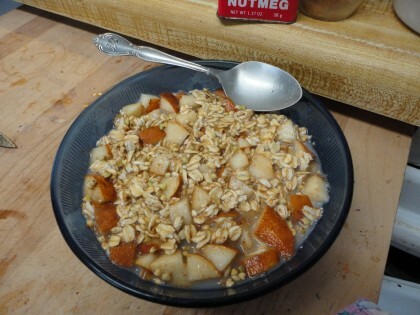 I find it delicious, wholesome, filling and complete, especially with grated pear and banana in it. A have a huge amount and I think my body has learned to absorb it and use it, because I’m never full, just perfectly satisfied. I had heard that oats isn’t always gluten free. But to make it gluten-free, what do they do to it? Or is the gluten free kind another variety of oats plant? Anyway, as i have mentioned before, I’m not sure that I have a problem with gluten, just always vaguely feel you’re supposed to avoid it. I will explore the kasha-based recipes you mention, because I’d like to give this buckwheat stuff a fair chance. Yes, raw. Since the groats, or seeds, are seeds, they are not anywhere near as hard as a dried grain like rice. They soften like oats do when moistened, as in your muesli recipe. Yet they stay crunchy, too, sort of like grape nuts cereal. That’s why they take such a short time to cook on the stove, too. Oats actually are gluten-free, but often get contaminated with wheat protein and starch by being processed in plants that also process glutinous grains. So gluten free oats are those certified to have been grown, harvested and processed in plants that do not process wheat and barley and rye. I will work up a little post about the pear sorbet. Coming soon! Wow! Groats! I haven’t made groats in so long. Thank you, thank you, thank you. can you tell me more about coconut aminos. I don’t eat coconut or coconut oil because of the sat fat. How does c. a. work please? Thanks for your question. I don’t eat coconut or coconut oil, either, for the same reasons as you. Coconut aminos are aged coconut sap blended with sea salt. The label lists them as having no fats, though, by law, there may be small traces of under .5 grams, I believe. I use these in very small amounts in place of soy sauce or tamari, because I am intolerant of wheat (soy sauce has wheat in it), and soy spikes my pain response. The coconut aminos are also lower in sodium than soy sauce, tamari and Brag’s Aminos, which also helps my digestion. But if you can have soy and/or wheat, then you can use soy sauce or tamari instead. Or the Bragg’s. Hope that helps. If you click on the link on coconut mainos provided in the post, hopefully you should be able to read the product label. ps: of course you can always just use water or broth to saute the mushrooms. The splash (less than a teaspoon) of coconut aminos is just my personal embellishment. 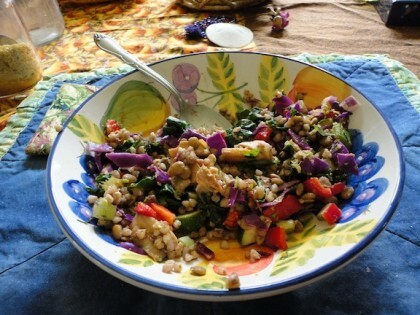 mmmm, I made the buckwheat today. What an aroma! Going to pack it for lunch at work, with Fulenn’s eggplant stew! ha! It just looked so good on your plate, I copied directly. 🙂 I added spinach to my stew, so it’s got the very pretty dark green here and there among the red of the tomatoes. That’s great! Thanks for sharing the buckwheat and eggplant stew love with me! I bet you are going to really enjoy that lunch today. I think spinach goes great with it, too. I was going to tell you about kasha varnishkas, but I realized that it probably had things in it you can’t eat (eggs and oil, for example, and butter). But you did quite nicely without those things. I have appreciated learning about buckwheat groats and have been replacing walnuts (which we can’t eat) in recipes with buckwheat groats. Do you need to cook the groats before using them? I rinse them but then just sprinkle them into the recipe I’m using. Since I had never used them before, I’m wondering is I need to cook them first. Thank you for telling me you appreciate learning about buckwheat groats. I use them as you describe, and what you’re doing is just perfect. Just sprinkle them in uncooked. That’s a great way to replace walnuts in a recipe. In another context, you could cook them first, in a recipe for veggie burgers or veggie loaf, for instance, and they would stand in for all or some of cooked rice or oats that might be called for. They can also be ground up in a grinder or blender and subbed for some of the flour in a recipe. Enjoy your groats all these ways if you like! Thanks, Patricia, and welcome! Happy to know you that you also love Dr. Zhivago and to eat out of a bowl!! I just started my raw food diet a few months back. I’m really enjoying it but I feel that I need to spice things up a bit. That’s where the buckwheat groats come in. I enjoyed your recipes a lot. Thank you… Keep up the good work. You’re welcome, Seyed! Thanks for letting me know. Wow, thank you so much for all the delicious recipes and the Dr. Zhivago narrative too – very sweet of you! I love buckwheat more than almost anything! Everyone should be eating it and they would if they knew how wonderful it is. Thank you again. I plan to try many of your suggestions. You’re welcome, Florence! So glad you enjoyed the buckwheat post and the nod to Dr. Zhivago, too. 🙂 I hope you enjoy trying out some of my suggestions.